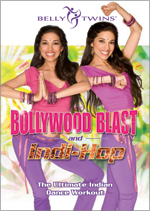 Bollywood Blast The twins have taken the hottest moves from their breathtaking Bollywood shows and created two dance-based workouts that will burn off extra pounds! Bollywood Blast opens with yoga-inspired stretches, continues with a strengthening series of isometrics based on classical Indian dances, and blows up with a cardio series containing the latest Bollywood moves.The second DVD is Neena & Veena's popular groundbreaking Indi-HopTM, which is bhangra (India's hip hop), spiced with their original mix of yoga and martial arts. This cutting-edge workout is guaranteed to make you sweat! Four extraordinary exercise programs combining the beauty and benefits of bellydancing moves with the fitness principles that have made Veena & Neena the most sought after instructors in Los Angeles! Each program is just thirty minutes long and set to the incredible music of Ron Wagner. Join Veena & Neena Bidasha to experience the extraordinary benefits of Bellydance. These workouts are not only fun, but also a delightful way to develop personal expression. Bellydance movements are a safe, simple and effective way to achieve lasting fitness. Basic Moves - "Belly dancing provides us with a way to stay healthy and fit, and a way to stay relaxed and open," say professional belly dancers Veena and Neena Bidasha. They start by teaching the isolations that they'll incorporate into dance movements later: moving the head from side to side on an imaginary line as if separated from the neck, "snake arms" that seem to float in the air, "shoulder punches" (as if your shoulders have fists) that turn into shimmies when speeded up, "rib slides" (using your torso muscles to push your ribs from side to side), and a variety of hip moves. Then you put it all together and voilà--you're belly dancing! After too short a dance, you get down on the floor for stretching. From the back cover: "Welcome to the World of Bellydance Workout! This ancient form of artistic movement has been practiced for thousands of years and remains exceptionally popular throughout the world. Once performed as entertainment for royalty and common people alike, these beautiful movements evolved with strong links to womanhood, sensuality, and even fertility. But Bellydance is also one of the safest, simplest, and most effective ways to achieve lasting fitness." Shelly from Missouri: I thoroughly enjoy doing this tape! It's a quick 30 minutes and I get better each time I do it. I recommend it totally to anyone who is interested in learning more about bellydance. I never get tired of it! My 4 year old son even tries to do it with me and enjoys it. Fun workout! From Cleveland, Ohio: This is a pretty fun way to get a beginning taste of bellydance. The 30-minute routine doesn't feel strenuous, but the next day I could really "feel the burn" in my shoulders and hips. The soundtrack is Middle Eastern-type music and keeps up with the tempo of the workout. The instructors are also pretty easy to follow, although it's easier just to watch them rather than to strictly listen to the narration, which can be kind of vague. All in all, though, it's a fun tape, and I would buy others from the same series. Shelly from Missouri - This is the first bellydance tape I've tried and really liked it. After a few weeks, though, it got a little boring. (Hint, buy another one in the series or get their boxed set for variety.) It is for sure harder than it looks! The floor ab workout at the end sure puts you to the test. Overall, it's a fun way to get in shape and the sisters are very impressive! athena-zengaia from Washington State - If you just sit and watch this video you may think, "So what? That's not so hard." But spend 25 minutes or so with these sisters and you'll feel it the next day. The movements in this video are geared to bellydancing. The layering of movements [such as ribcage circles with egyptian arms] is key in proper bellydancing. The slow methodic movements of arms, ribcage and hips on this video help tone the upper body and gain control of torso muscles. The floorwork is a little tricky and you may have to work up to it. Not an aerobic workout, but definitely a muscle toner, especially for the upper arms and shoulders. Not a bad little abs section added, focusing on more traditional ab exercises needed to round out the workout on the video. Adds a nice variety to any home based exercise program. athena-zengaia - I have this video and use it as an alternative when either I don't have a lot of time, or I'm just looking for a little change from my normal routine. These two sisters are obviously skilled dancers [as the small performance clips at the end prove]. The workout on this video is fairly simple, and what I like is I can do it barefoot. I can kick off my shoes and dance along. It does get the heart pumping and the 25 minute workout breezes by fairly quickly. On the down side, the beginning is slow. The steps in the beginning are too simple and go on for too long. I don't care for the finger on the forehead move. There is a long period where they just do the same folkloric step with one finger on their forehead. What I do like about it is I can exercise using bellydance steps and listening to middle eastern inspired music [not necessarily authentic]. I have been dancing for over two years and although this isn't a tape that teaches bellydance or its technique, it is a way to incorporate a little bit of bellydance into a daily exercise routine. From California - I felt it was necessary to speak in defense of the video. The previous review may have given too negative an impression. Read the title: Fitness for Beginners! It is not a dance instruction video. It is a workout video. It is not intended for experienced dancers. It is for beginners. Personally, I think it is a wonderful video especially for those of us who want a fun, low-impact way to limber our bodies in a very feminine way. It is perfect for women like me who are not in top shape but want to exercise and need something more motivational than "one, two, three, feel the burn." On a more esoteric note, Bellydance is a wonderful way to connect with the power and beauty of the feminine body, and the instructors on this tape are perfect examples of the grace and sensuality expressed by this system of dance. Just watching them was very inspiring, and I felt motivated to try the moves myself. Also, nothing is too difficult or too stressful on the body, which is the point of a beginners workout. It is also perfect for those of us at an age where we are liable to dislocate something trying to do Tae Bo. As the previous review stated...this is probably not a video for experienced dancers, but it is a terriffic tape for beginners and for those of us not wanting to become cabaret performers, but rather looking for a way to improve our health, feel good and have fun at the same time. I highly recommend it. From Bethesda, MD - Cheerful, attractive dancers Veena and Neena appear on a beautiful, well-lit set. This promising beginning, however, gives way to an extremely repetitive, rather uninspired routine. Most movements are hops and bouncy steps (from Egyptian folkloric dance); arms are generally held in one position for long periods of time. One step was repeated 28 times (on the same leg!) before there was any change at all -- I found this tedious and a strain on my knees. I also wished for a more thorough warm up. The music is new-agey middle eastern music -- pleasant but perhaps a missed opportunity to share authentic Egyptian folkloric music? Intermediate-level bellydancers and aerobics enthusiasts (I count myself in these groups) may be bored and may not get a vigorous cardiovascular workout. Beginners of either groups, if they have no joint problems in legs/hips/ankles may enjoy the novelty of the tape and find it appropriately challenging. Surprise gems: the two short performances by the instructors during the credits at the end of the tape. I really enjoyed seeing these lovely ladies perform -- I only wish they had brought more of those fine moves to the actual workout! The Bidasha sisters have impressive credits and dance well -- perhaps sharing anecdotes or styling/posture notes during the steps would reduce monotony of repetitions. Another improvement would be to offer advanced variations (what a perfect setup -- twins! -- to do this. One can do advanced variation while other maintains simple version). This would broaden the appeal of the video to exercises of various levels and give more depth to the tape. Los Angeles Times "...playfully direct and confident style...beautifully mastering the rolling midriff, switching hips and jittery whole-body vibrations." athena-zengaia - These two sisters are adorable. Although not necessarily physically taxing, this tape is fun! Anyone interested in bellydancing, this video helps with discipline of the hips and makes exercising fun. I've been bellydancing for over two years and enjoy this video because I'm able to exercise and use the artform I so love at the same time. This specific video does not teach technique though. This video is geared towards just getting a fun workout that focuses on the bottom half of the body. The workout itself is about 25 minutes long with a performance clip of one the sisters at the end. The workout isn't terribly difficult or strenuous, but it does get the heart pumping. Worth investing in the box set.